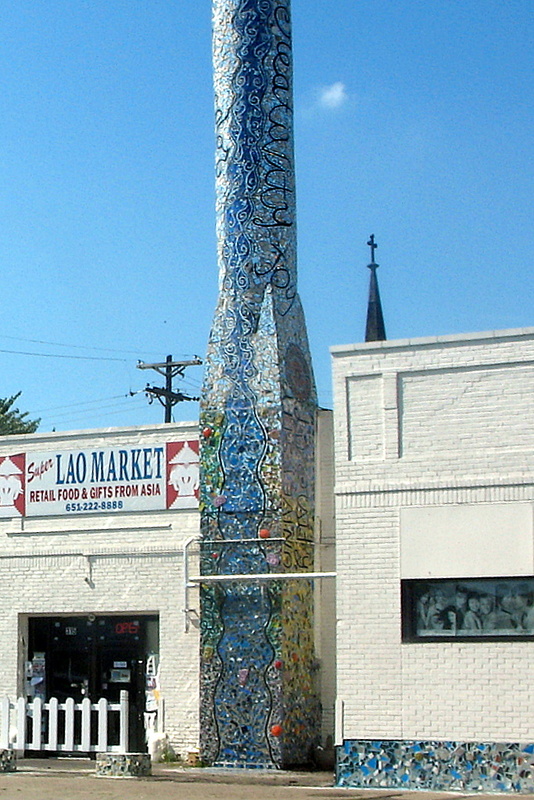 This incredible mosaic chimney can be found on University Avenue between Snelling Avenue and Rice Street in St Paul. I honestly would like to know how long it took to complete the design. What caught my eye is the white picket fence in front of the Lao Market, do the customers have to jump over it to enter the store? What better way to spend a Sunday morning than with my cat and a cup of freshly brewed coffee. 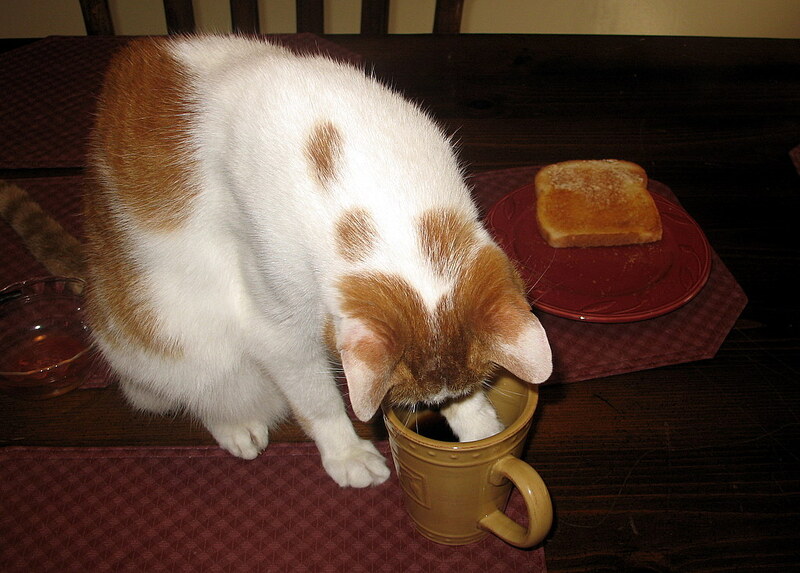 This exclusive shot of my coffee drinking cat can only be found right here at the Twin Cities Daily Photo. The little rascal will dip his paw into the coffee and then lick it's paw to get that caffeine he needs to jump start his morning. If only I can get him to shovel my drive way after a snow storm, I'd be set! I will give credit where credit is due. The weather scarecasters were half correct on their snow forecast for my area. I watched their clip they posted on their website [I personally do not watch the live news broadcast] and they did say the snow took longer to get here than originally predicted. It's in full force right now as the snow is piling up as I type in the comfy of my warm office with the fireplace blazing. Now I do have to complain about something and the people who live in Minnesota. Do you not realize it snows in the winter? Have we forgotten what this area can give us this time of the year? We are not called 'Minne-snow-ta' for nothing. Friday before any snow really started to hit, I had to make a trip to the grocery store to pick up some night time cough medicine for my children who are battling the flu. I find my one item and head to the cashier to pay. There are at least ten people in the eight or nine lines that were open. I'd never seen the lines this long on a Friday night. One would have thought it was the typical Saturday crowd purchasing a months worth of food. Not so, the weather scarecasters had done their job and everyone was in a panic. while standing in line with my one item, there was a teacher in front of me. While chatting with her about the absurd lines, she mentioned that several of her studets had called in already and said they would not be coming to class the next morning. Keep in mind, it hadn't started snowing yet but they panicked and thought there would be snow up to their belly buttons by morning. They were wrong, but the weather scarecasters worked their mind altering magic on the young minds. Lastly, my wife is a nurse and she will be headed into work about two hours early as several of the staff have called to say they would not make it to work because the roads will be bad in the morning. 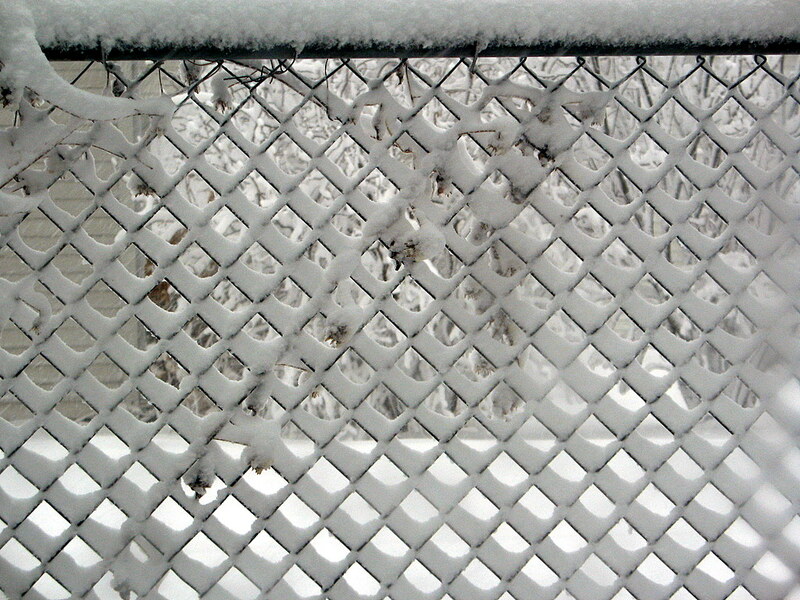 At the time of their call, it had snowed about one inch total. Wouldn't it make more sense to call in after the snow falls to see if it's worth calling in because the roads are bad? Again, the weather scarecasters were successful in scaring the hell out of everyone. I'm making a plea to all Minnesotans, it snows here during the winter season. 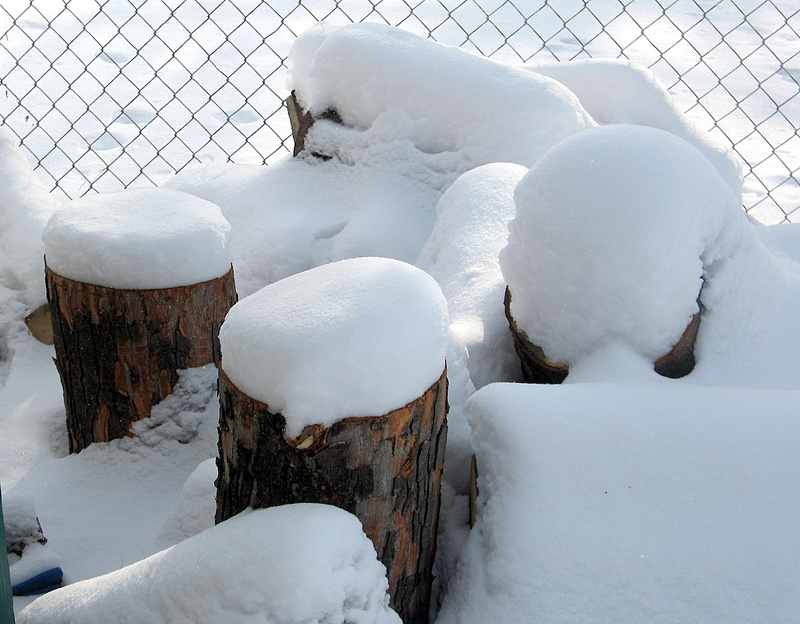 Be prepared and for goodness sakes, unless this is your first winter here, you should know how to deal with the snow. This is NOT a warm climate state where they do not have snow plows. We all should know how to deal with this type of weather already. It snowed last year, and the year before, and so on. Unless you're an out of state transplant like Chris and Deb of the Minneapolis Daily Photo, you really don't have an excuse. Although they have lived in Minnesota for 13 years now and I would bet they know how to handle the snow by now. Here in Minnesota we are under a Winter Storm Warning. The scare weather forecasters are predicting anywhere from 4 to 16 inches of snow depending on who you hear it from and how many hours ago. I've become so discouraged with the weather forecast the past couple of years. They like to scare people with the weather so you have to tune into their forecast to see how much snow they think will fall. It's become so comical on how bad their predictions are as of late. I know these are just predictions and a storm will do whatever it wants, but my goodness, stop scaring people into thinking the end of the world is coming with a snow storm. Start forecasting something that is believable and I'll start tuning into your presentation. 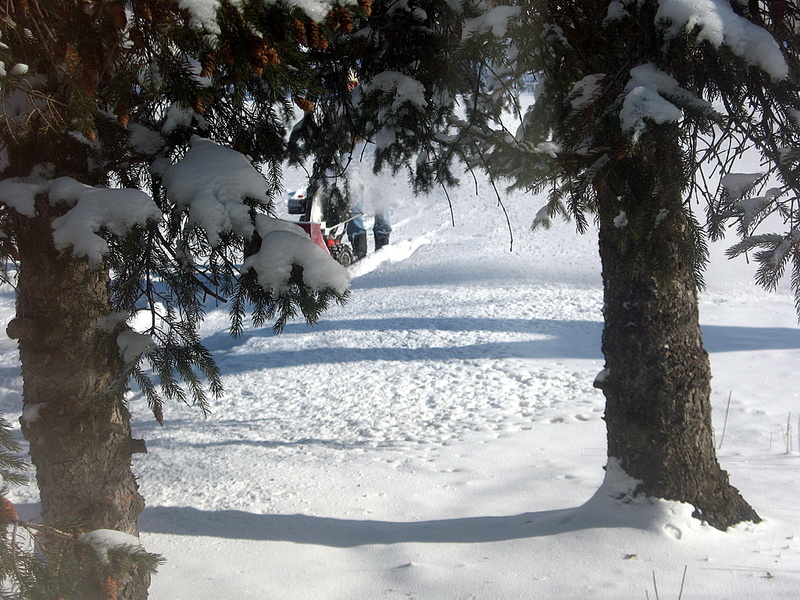 Today's photo is of my neighbor clearing his driveway with the snowblower. It was taken well over a month ago when we had a snowstorm that was predicted correctly [they got one correct out of 15 this year]. This morning there was more grass and dirt visible than snow, but there was some freezing precipitation falling the past couple of hours. Perhaps they will be accurate this time....stay turned. 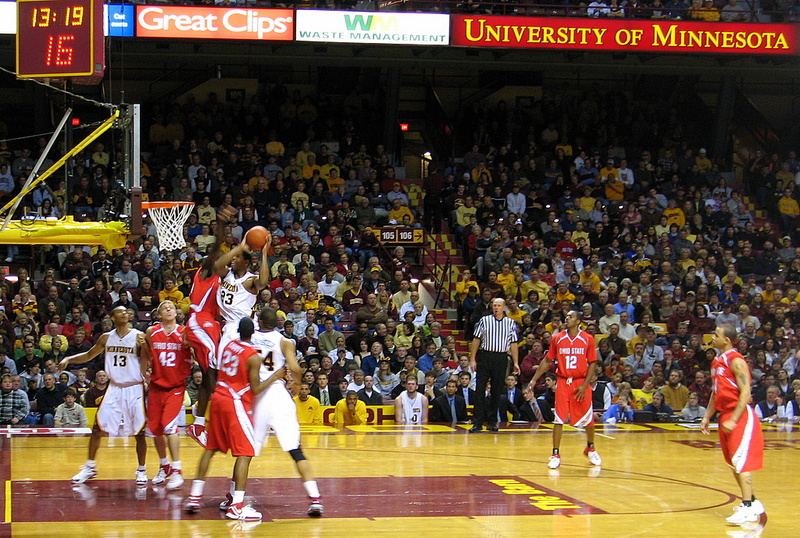 The Gopher Basketball team faced currently number 3 in the RPI rankings Ohio State over the weekend. Ohio state proved with authority why they are ranked so high over the Gophers who are on the opposite end of the scale in talent. While the Gophers did give them a game for the first 12 minutes of the contest, it was an easy win for the Buckeyes. In today's photo, Greg Oden is about to block the attempted shot by Brandon Smith. The final score for this one, Ohio State 85, Minnesota 67. It should be noted, Williams Arena, where the Golden Gophers play, is the last remaining raised floor for a college team in the country. 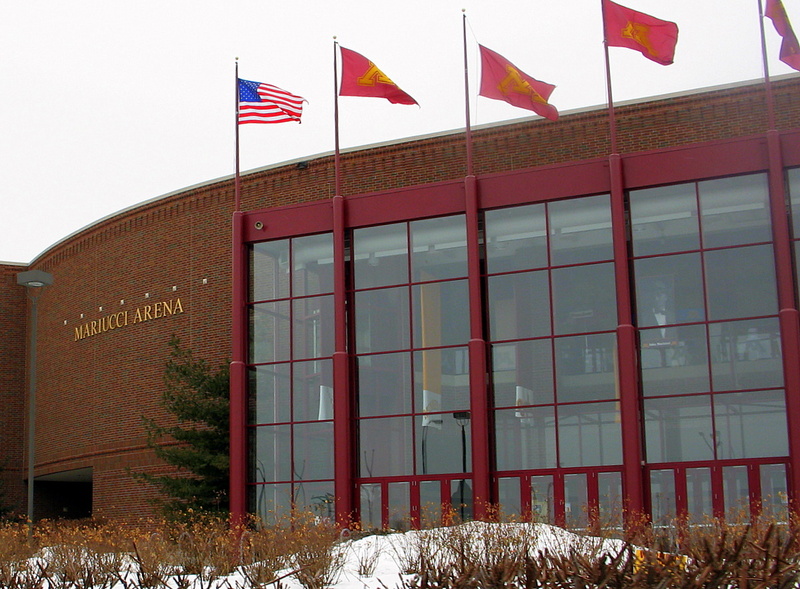 As I mentioned yesterday, across the street from the Mariucci Arena was Williams Arena, otherwise know as "The Barn". While other cities tear down their old facilities and build brand new ones, the University Of Minnesota has revamped, added on and will make this building last for generations to come. The Barn houses the women's and men's basketball teams. The Men's College Hockey polls currently have the Minnesota Gophers ranked number 2 in the country. The Gopher Hockey team have played in this new Mariucci Arena since the 1993 season. The moved from across the street where they played in the old Mariucci Arena that was attached to Williams Arena, otherwise known as "the barn". I do hope some of you get today's title. 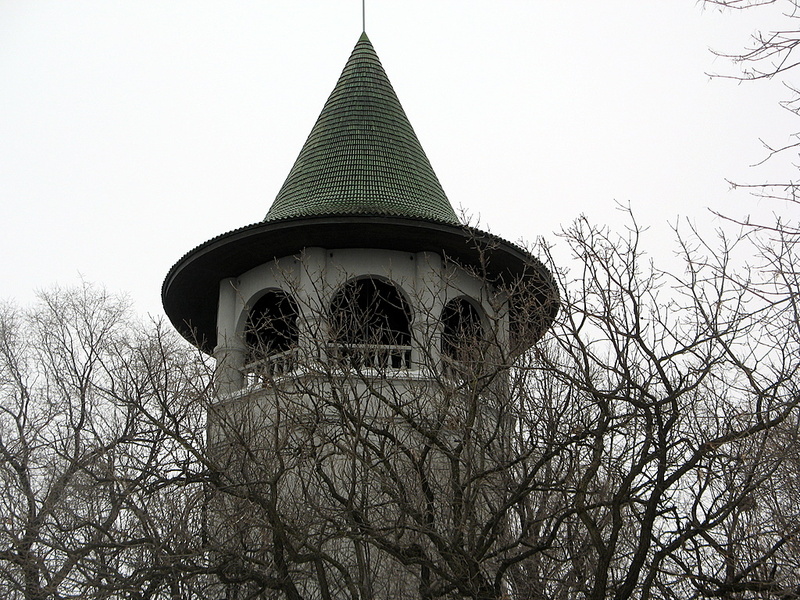 I shot a close up of the Prospect Park Water Tower from yesterday's photo because simply it looks like a very large witches hat to me. Plus I love the texture of the roof and whatever it is made out of. Maybe your monitor is better than mine, but this small photo makes the roof texture look awkward. Click the photo for a crisper and larger image. Last year back on August 28, 2006 I posted a distant sky shot of a tower that I'd always seen, but never was close enough to figure out what it was. A local blogger thought it was Prospect Park which it turns out to be correct. Another local blogger commented a few weeks later that it was a water tower to the neighborhood. Even looking at the tower today, it's hard to believe that it's holding gallons of water inside. 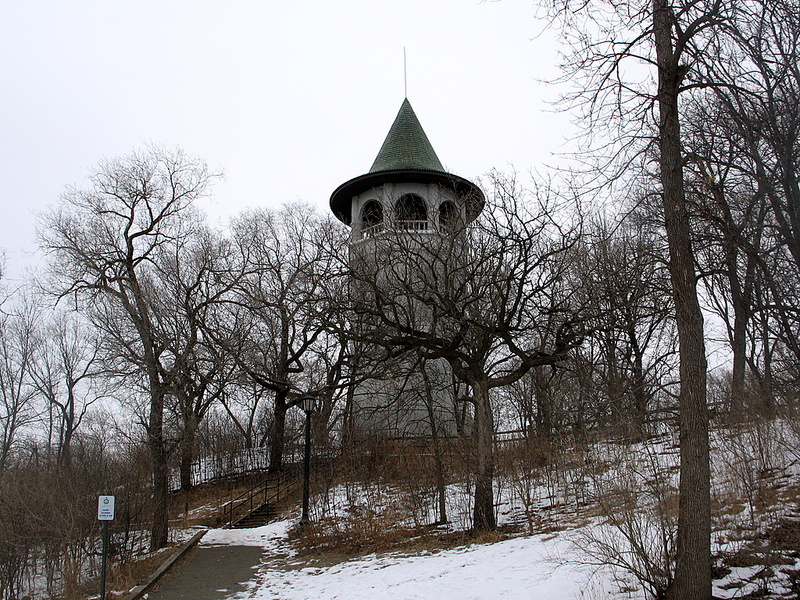 The tower is close to the Minneapolis, St Paul border and just off of University Avenue. The tower is open to the public once or twice a year for observation and I'm told you can see quite a distance from up there. 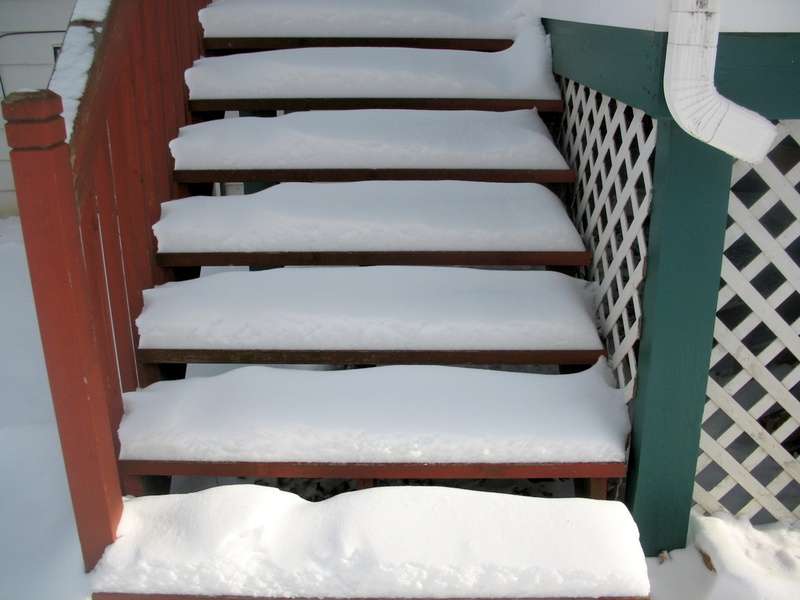 the stairway of snow, often found shortly after a snowfall in Minnesota. 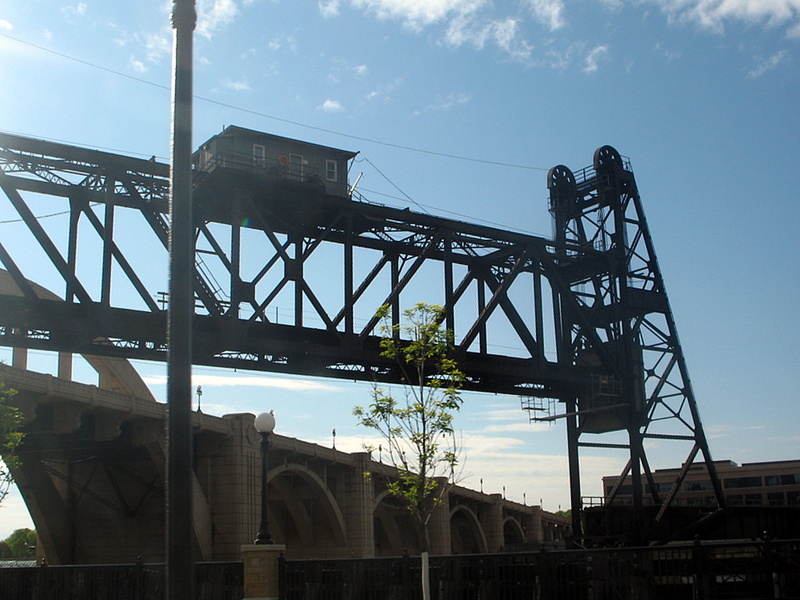 ba-dum-dum....crickets....this is the rail road lift bridge that crosses the Mississippi River into downtown St Paul. I'm not sure how long the rail bridge has been there, but it's still in use today. Looking beyond the lift bridge is the Robert Street Bridge which I posted about yesterday while ON the bridge. Today I'm on Sheppard Road, it travels along the Mississippi River and under the Robert Street Bridge plus the lift bridge. Back in May 21, 2006 I posted this view traveling in the opposite direction. You can just see a hint of the lift bridge, but it gives you a better view of when the train tracks lead too. Yep, it's true, I'm on the right side of the Robert Street Bridge as I snapped this photo while heading into downtown St Paul. Maybe it's just me, for the longest time I've always wanted to run up and over that arch! I've wanted to post this photo for quite some time now. I really hated how the photo turned out, but I only took one photo unfortunately. 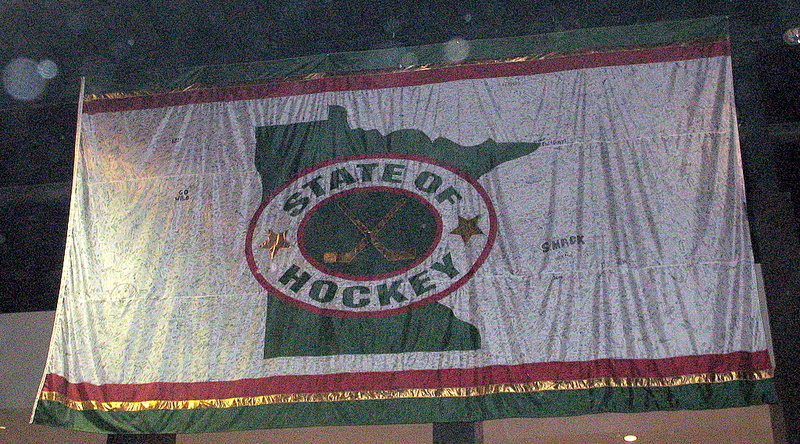 The flag was on display for the 2005-2006 Minnesota Wild hockey season the year after the year long strike season. The reason the flag was on display was the season ticket holders signed the flag as a thank you/welcome back to hockey or whatever you want to call it. The fans were in support and were ready to watch some hockey after the absence of an entire season. All of the strange marks on the white part of the flag are their signatures and not dirt marks. You can make out a couple of the larger signatures, but the rest are just washed out with the poor photo quality. The flag is no longer on display since the start of the 2006-2007 season and I took the photo shortly after the final game of the previous season ended. Thus I lost my chance to retake the photo. 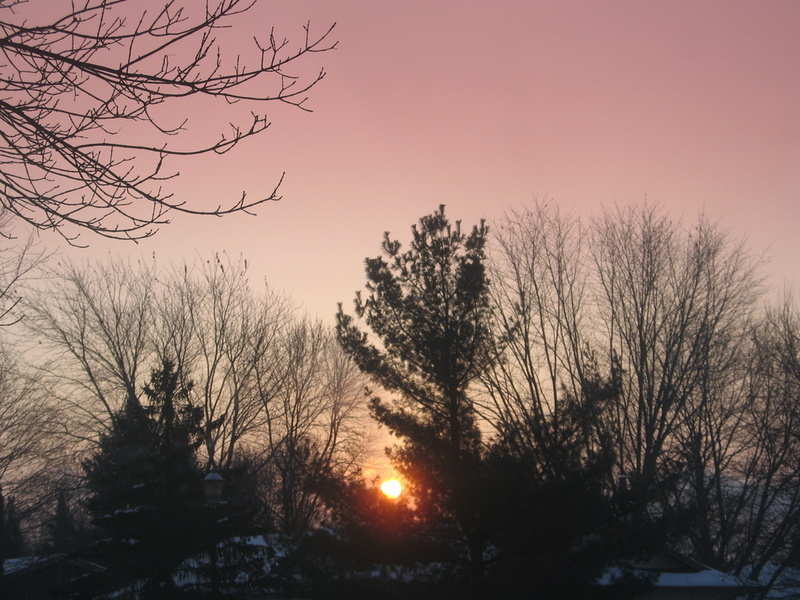 239 photos and this is my first sun rise photo on the Twin Cities Daily Photo. I took this photo during my recent vacation from work. I'm not sure if it's allowed to see the sunrise during a vacation, especially if the temperatures are less than 10 F [-12 C] at the time the photo was taken. Is that allowed on a vacation? It's like night and day. 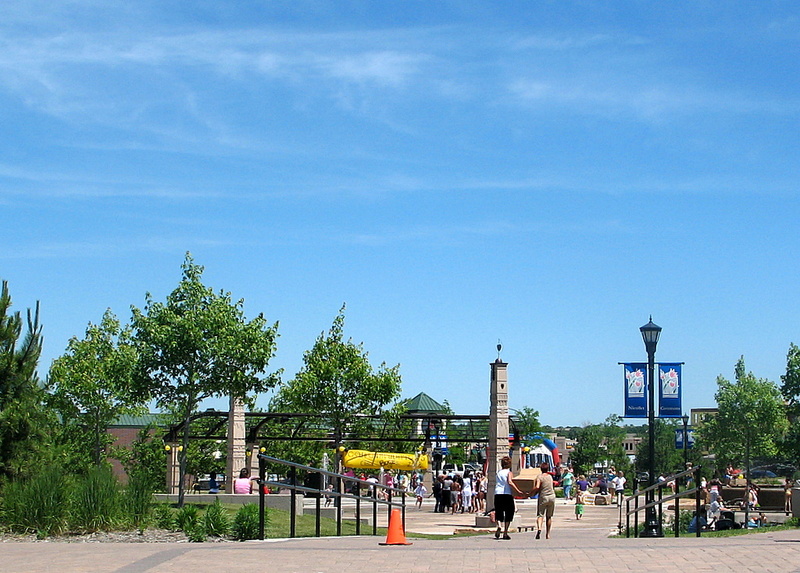 I found a photo from about six months ago of Nicollet Commons Park during a very hot day in Burnsville. I recently posted a snow photo of the very same park on February 5, 2007. I'm posting the summer photo to show the huge change in weather we have around here for those of you who do not have four seasons. I'm headed east on 70th Street in Cottage Grove. The people standing on the left side of the road are all sliding down the hill. Many of them are parents with their children as the location of the sliding hill is that close to the road. Everyone usually slows down if they are familiar with the road. 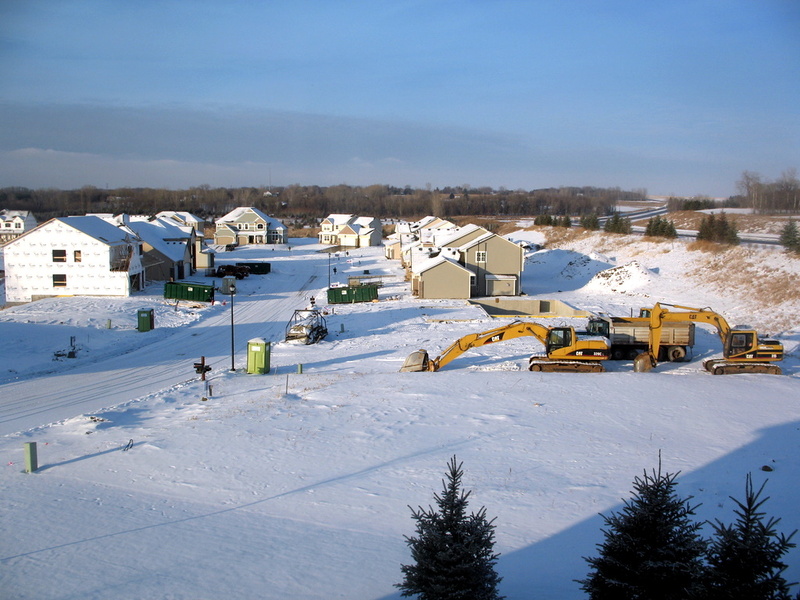 It's not that great of a sliding hill for the kids, but it's always used every winter as one of the main sliding hills in Cottage Grove. You know when you drive down the road and there is a corn field with perfect rows of corn. It's almost hypnotic to watch the pattern as you pass alongside it. 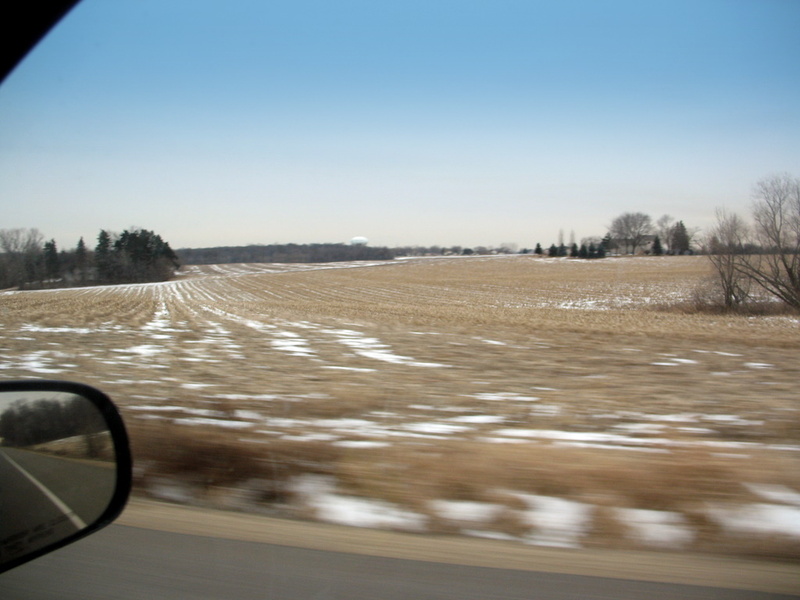 Now take the end of the growing season, the fields have been cut and throw in just a touch of snow and you have rows and rows of corn. It still had the same affect as we drove down the road. Hopefully this photo captured what I saw that afternoon. 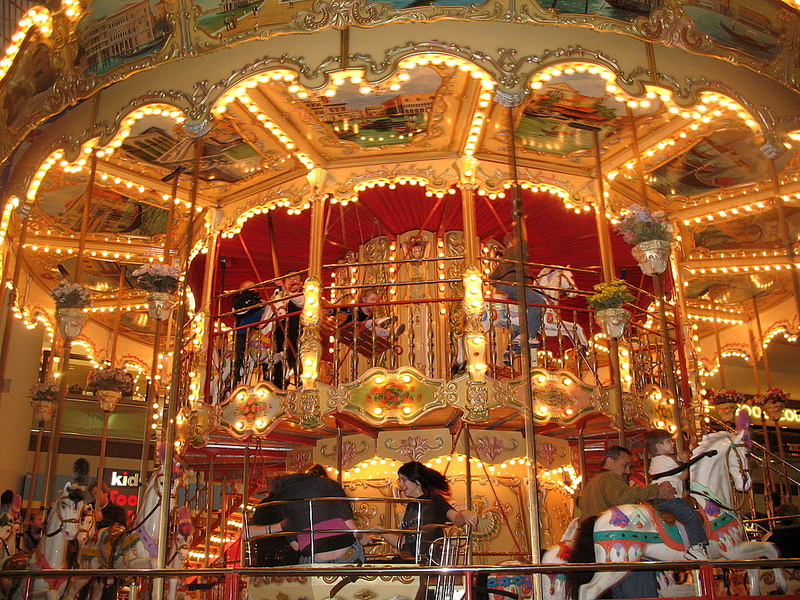 This merry go round is featured at the Maplewood Mall. It is $2.50 or perhaps $3.00 dollars now to ride. 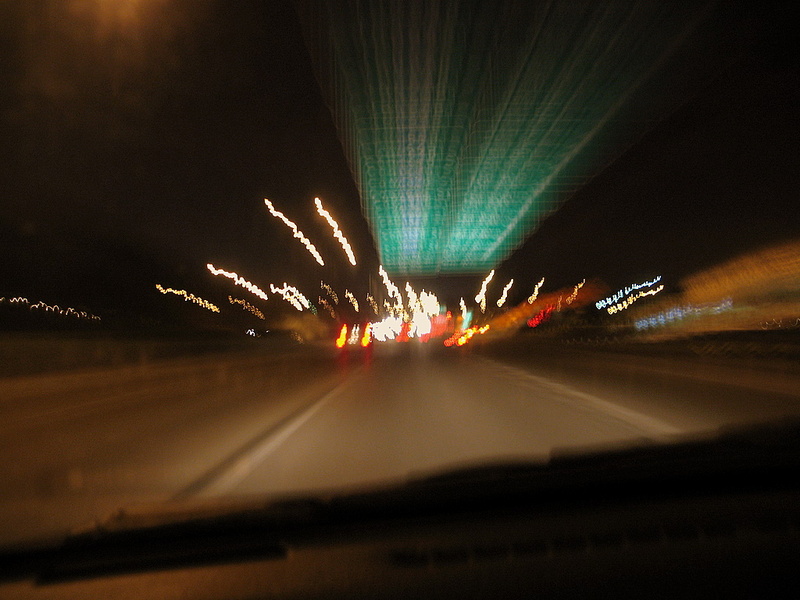 I believe this was a five second exposure time while on the highway one evening. I've been experimenting with this type of shot from time to time and pretty much like how this one turned out. I've had better and I've had much worse. Well, it once was a cornfield, but now sits a new neighborhood of houses. We toured a couple of models in this development recently. I really liked the view from the home we were in, but I didn't care for the two empty lots you see between me and the next house over. To the right is a rather busy street and that's not a good thing to my ears. I must admit, I did like the model homes we looked at. If you didn't notice, you were redirected to the new site name for Twin Cities Daily Photo. Please update your bookmarks. I'll also be working on a template change that I've been wanting to do for quite some time now. 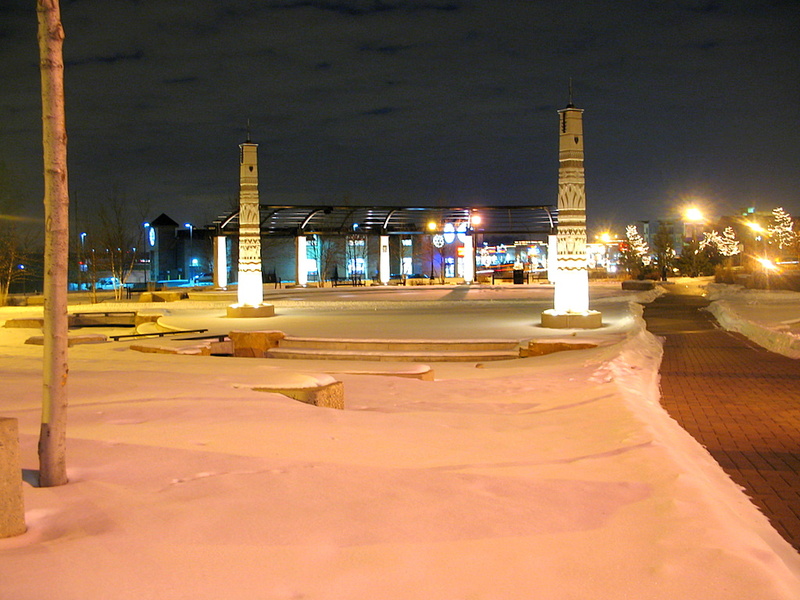 I believe the name of this park is Nicollet Commons located in Burnsville. It's fairly new to the area as there used to be buildings on this lot if I'm not mistaken. It's been a while since the buildings were there and this entire area has completely changed beyond recognition. I can tell you, in the summer months there is lots of water in areas of this park. Perhaps you can pick a few of them out from this photo. This photo was taken a couple weeks ago shortly after our last big snowstorm and before the temperatures dropped to below zero like they are now. If you need more proof of how cold it is, check out a few local blogs reporting on the weather: Carol at St Paul Daily Photo and Chris at Minneapolis Daily Photo both reporting the temps around - 8 F degrees below zero. 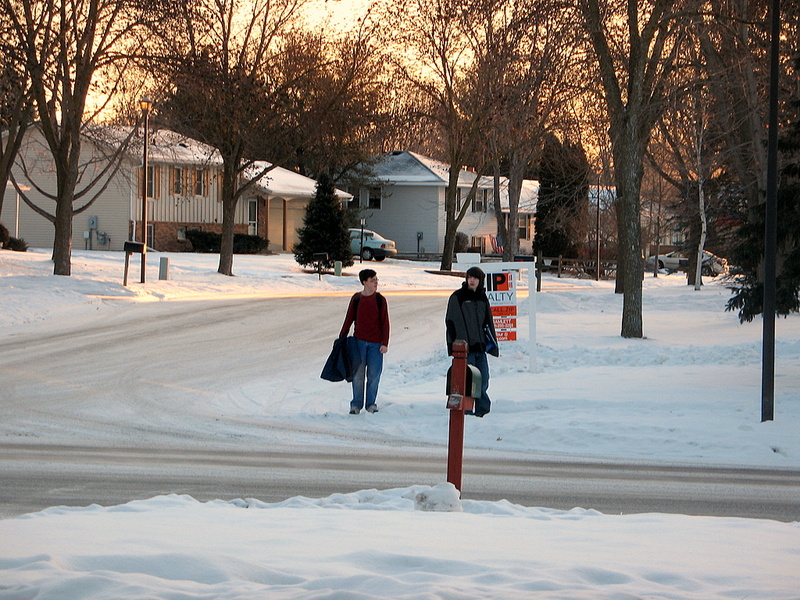 Those two blogs are so dang close to me, just out of stone throwing distance, but they can relate to this photo....a 5th or 6th grader in my neighborhood has been waiting on the bus to bring him to school while CARRYING his winter jacket. Friday's temps when I took this photo was about 5 F degrees below zero. I'm not sure exactly where he lives, but he would look much cooler if he was wearing his coat instead of carrying it. He should take note that the other child IS wearing his coat because he is rather smart when it comes to how cold it is. I'm thinking back when I was his age and can not recall doing something this dumb thank goodness. I just downright love this photo of a Bald Eagle that was at the Minnesota Zoo this summer. I see the birds quite often during the summer months around town in various areas and especially in the northern part of Minnesota where the population is less. They are quite the site to see if you've never seen one fly the wind currents. 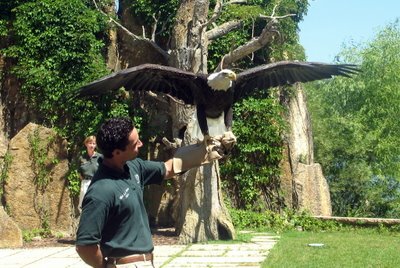 They can go many minutes without flapping their massive wing span. I actually struggled with the February theme day as it takes a lot to annoy me and I wasn't going to participate. However, I learned a few things in the month of January and I'm rather annoyed, thus my photo of traffic. You see, back in 2003 the government finally started a bridge/highway reconstruction project. It was a very time consuming, a lot of money and a lot of work to get this problem area corrected. 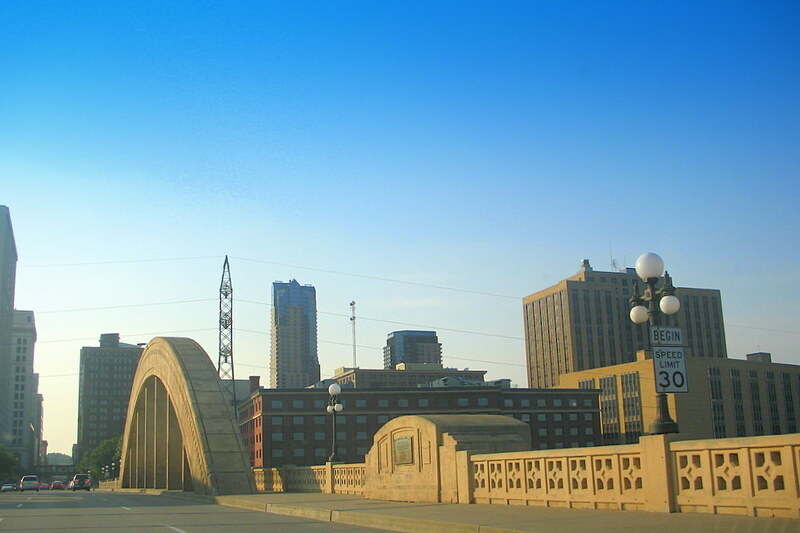 [I'll try to make this short] Part of the project was to replace the Wakota Bridge over the Mississippi River. It was 2 lanes in each direction. They would build one bridge, divert traffic to new bridge. Then build a second bridge and end up with FIVE lanes of traffic in each direction. Yes, the highway was a major traffic problem area. Now the annoying part. They built the first bridge in what appeared to be the normal time frame. [keep in mind, this was a five year project] However, it sat there for a long time with nothing more completed on it. Months passed. I find out that there was a delay in the project. The claimed they had to "retro fit" new technology into the new bridge. Wow! That's exciting! That was the "feel good" term that was used to disguise that the bridge had developed, and I quote again "micro cracks". If cracks the size of your arm is considered "micro" then okay, they have a point. They worked on the bridge for an extra year fixing the problems. More money spent. Instead of a five year project, it has now become a SIX year project. Fine, I can live with it for another year. 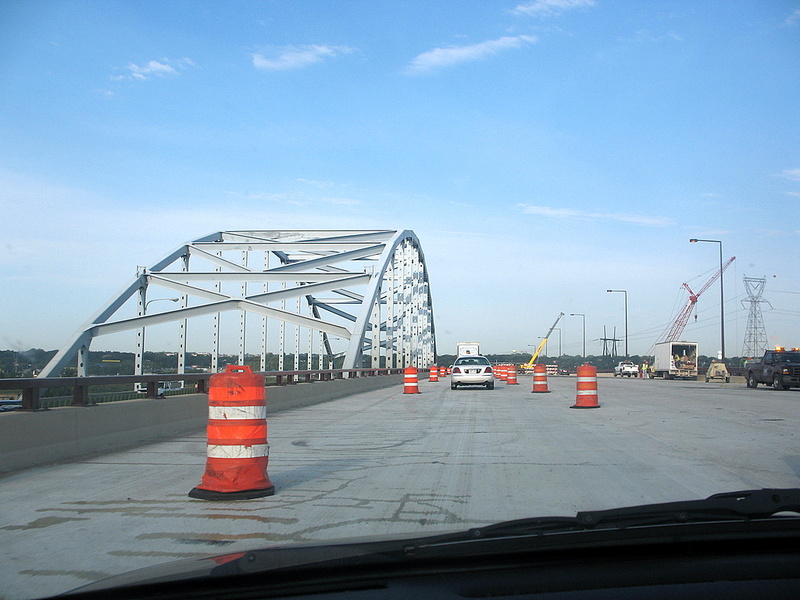 Wakota Bridge update....and I quote [and link]: "The Minnesota Department of Transportation announced today that the eastbound Wakota Bridge construction has been eliminated from the current contract. The decision came after months of negotiations failed to develop an agreement for construction of the remaining bridge. 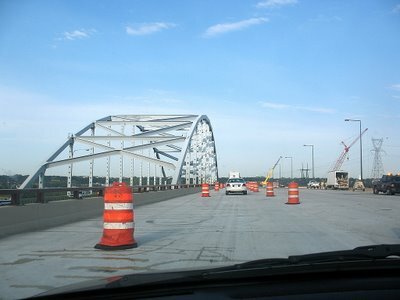 According to Khani Sahebjam, Mn/DOT’s Metro District Engineer, “Mn/DOT concluded that in fairness to Minnesota taxpayers and to fulfill our responsibility to manage construction costs, the eastbound Wakota Bridge construction would be reopened for competitive bidding.”"
Yes, they have opened the second bridge back up for bidders so they can complete the project. MORE DELAYS and will most likely push the completion date in to 2009. A SEVEN year construction project. This annoys me very much now.